Females make a nest and lay from 20 – 50 eggs. Each egg weighs 2 –3 oz each. Hatching occurs after 65 days of incubation. Small alligators hatchling eat insects, crabs, crayfish, small fish, frogs, snails and many other small prey. 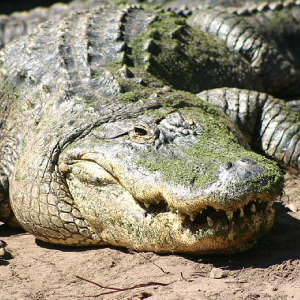 Larger alligators eat fish, turtles, mammals, snakes, crabs, crayfish, birds, insects and other alligators. If the temperature drops below 86˚F, all eggs will turn out to be female alligators. If the temperature rises to 93˚F or above, all eggs will turn out to be male. At 89.6˚F, more than ¾ of the hatchlings are female. The nest is made of mounds of vegetation and mud that can rise 3.5 ft and twice as wide. The American Alligator can only withstand brackish water for short periods of time. They are the largest reptile in North America. Can go through 2,000 to 3,000 teeth in a lifetime.